I should have known this trip wouldn’t be the best as soon as I was asked to pay for overweight luggage at Heathrow Airport! And I would have been right. Five days of fog, one day of rain with grey skies and one, just one afternoon of sun and good light. Not the weather we had hoped for during a week of wildlife photography on the island of Texel. However, good food, good company and a couple of good sightings just about saved the day! First of all, this article is WAY overdue – I mean seriously, I got back from Texel at the end of February! However, life and my real job took over for a while and if I am honest, as it wasn’t the best trip my enthusiasm was lacking slightly…but finally, here it is. Secondly, I had big plans for this trip. I was going to do loads of filming, test out some new gear I had been given to review, do nightly updates via Twitter and Facebook (but then hardly ever got wifi reception despite paying for it) and generally aim to get the very most out of it with a vision of loads of great images. However, none of that was on the cards unfortunately. But you know what, wildlife photography isn’t about getting it right every time. It isn’t about always coming home with that once in a lifetime image. And it certainly isn’t about always having the weather on your side whenever you want to go away. And so I figured I’d share this trip with you anyway because this photography lark isn’t always a fairytale, and sometimes it doesn’t go to plan…and those times play as big a part in the life of a photographer as the ones that go right! The trip had been planned for a couple of months with friend Rene De Heer who is a veteran Dutch bird photographer of 25 years. Rene asked if I’d like to join him for a week on the island as it is a great location in the spring for various birds, and it was decided it would be good to have a trip planned for early in the new year. We knew it would be hit and miss with the weather but decided ‘if you don’t go, you’ll never know’. The day we arrived on the island the signs were good. There had been some snow on and off all week so there were some nice snowy fields and frozen water ways and nice light. We scouted the island out just to see what was around and just to get our bearings for a game plan for the week ahead before we retired for the evening. We awoke on day 2 to absolutely stunning conditions! There was snow and frost on the ground and the sun was low and shinning through a thin layer of haze, the light was incredible and as we headed out in our hire car (a Pugeot 3008 with full panoramic roof) we were in good spirits as the surrounding landscape looked beautiful. Unfortunately this was short lived as within 20 minutes or so the fog started to roll in…and that beautifully lit countryside quickly vanished behind a dull, grey wall, which it barely came out from behind for the rest of the week! With the exception of one brief afternoon for about 3 hours. Hare, lots and lots of Hare! Although there are various birds to be found on the island, including many birds of prey, we spent most of our time on Texel trying to photographing the Hare community, which is vast! 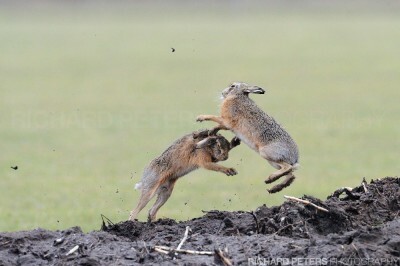 We found one particular group which at times would give us views of over 15 Hare within our field of view. It was a little early in the year for them to be fully boxing but we witnessed a good few fights as the mating season slowly started to kick in. The most frustrating thing would be sitting and waiting by a group for 2 hours. After watching them sit and not move in fog and rain you start to wonder if you should look elsewhere, but then you also worry that as it’s been two hours there MUST be some kind of movement about to happen soon, and that you don’t want to risk wasting the previous hours waiting in position…right? I tell you, a person could crazy trying to figure out what goes through the mind of these animals! On the day before last, we were scouting our usual haunt for the Hare when out of nowhere all hell broke loose with lots of male hare chasing just a single female. The image below is from the scene, but you can read a more detailed account and see a couple more images from that encounter here. We also met up with a couple of Rene’s friends…regularly published Dutch photographers Jan Smit, and his 19 year old son Mart Smit, who has also won various competitions including several instances in the Wildlife Photographer of the Year (WPOTY) competition AND Overall winner at the International Wildbird Photographer of the year 2009! Between them, these guys know their stuff and also run regular workshops in Holland – so it was great to meet up with them for an afternoon, despite none of us actually taking a single photo! Not for lack of trying though, we did walk about a mile out on to one of the beaches through the dunes, in fog, hoping for some activity by the water…alas there was none. I did get to have a quick play around with the Canon 1D mk4 though, which I was very impressed with. The highlight of the week for me I posted about in a separate article, photographing a Peregrine Falcon.